Update (11:16pm EST): Since this blog posting, Gilray has responded on his Twitter to the many fans asking about Abe's cancellation. 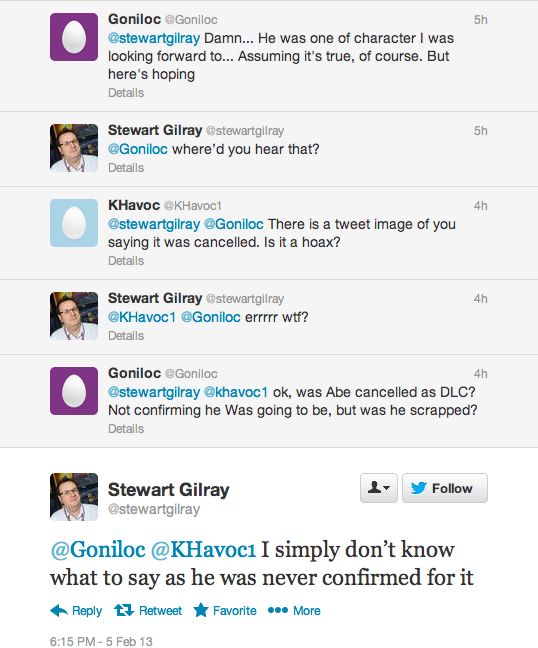 His tweets mentioned that Abe was never confirmed as Playstation All-Stars DLC while suggesting that his Tweets may have been taken out of context. Update (11:16pm EST): It should be pointed out that many suspect GoldenHelmet to be Gilray himself or at least a member of the Just Add Water development team. The account's post history suggests as much, from previously asking what Oddworld title should be made next to shedding light on the Xbox Live Arcade certification process. It's been a hectic week for those involved with PlayStation All-Stars Battle Royale. A week before the February 12th release of downloadable characters Kat (Gravity Rush) and Emmett Graves (Starhawk), Sony announced that it would be cutting ties with the game's developer SuperBot Entertainment. Alongside the announcement, Sony ensured that any future downloadable content will be handled by Sony Santa Monica. When news broke out regarding the shift in development, many fans wondered about the future of Playstation All-Stars' DLC. A day after the separation, it seems that some new information regarding potential downloadable characters has come to light. 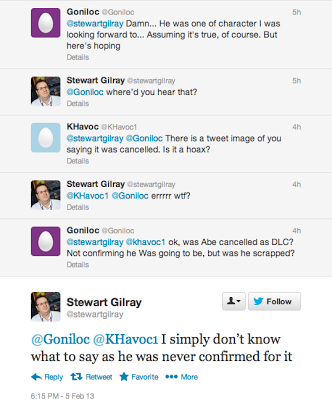 The NeoGAF post referenced above was one made by user GoldenHelmet. GoldenHelmet commented that Just Add Water Developments sent over a bunch of reference materials, including an Abe model from the upcoming Oddworld: Abe's Oddyseet - New N' Tasty. Closing the announcement of Kat and Emmett's release date, the Playstation Blog suggested that fans keep their eyes peeled in March for more info. 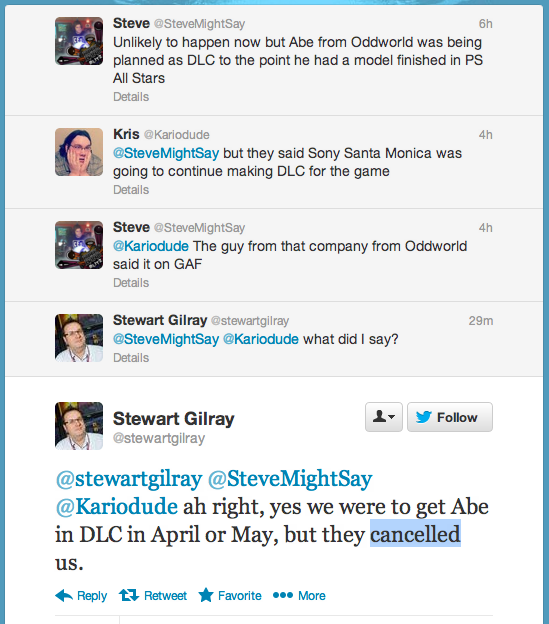 If Gilray was told that Abe would have seen an April or May DLC release, it is likely that the Oddworld representative would have been announced next month. It is no secret that Gilray wanted Abe to appear in Sony's mascot Brawler. 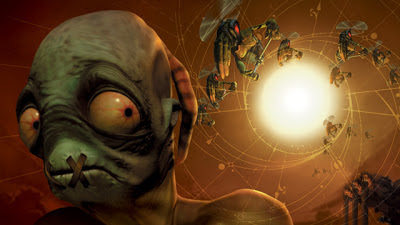 Back in September, CVG reported that certain sectors of Sony expressed interest in Abe's inclusion, yet the game's developers had not gotten back to the Oddworld Inhabitants team. Gilray goes on to mention in the article that the character's inclusion would be something that he and the rest of the team would love. It is possible that this can all be a red herring. It is equally possible that Sony Santa Monica is scrapping everything that SuperBot Entertainment has been working on and starting fresh. If this is the case, many players are left wondering if they should keep their eyes peeled in March, or scale back their expectations. As mentioned earlier, Playstation All-Stars Battle Royale is receiving both Kat and Emmett Graves as downloadable characters next week. They will be free to players for the first two weeks. Oddworld: Abe's Oddysee - New N' Tasty is set for a Q4 2013 release on the Xbox Live Marketplace and the PlayStation Network Store.